Basic Information: UPPCL is well known as “Uttar Pradesh Power Corporation Limited”. UPPCL Recruitment department is looking to recruit fresher candidates for Linemen posts under technician trades. 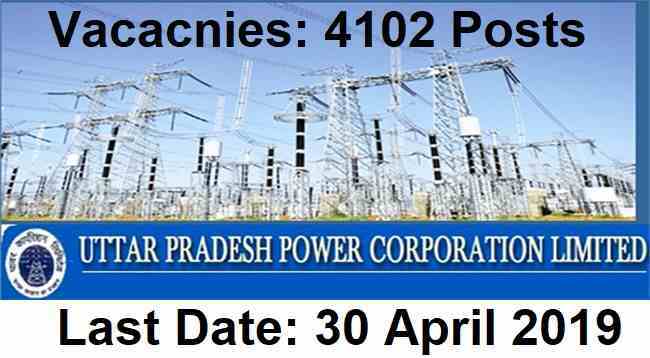 There are total 4102 posts which are going to be filled up through this recruitment process 2019. We are going to explain all the eligibility criteria and other term and conditions below in this job posting. So read the whole article carefully before applying online. The link for applying these UP Govt jobs will be active on 1st April 2019. To know more about this UPPCL Recruitment 2019 read the whole article carefully. 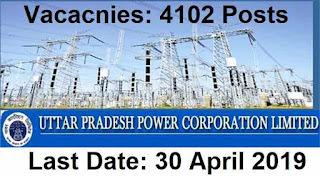 Applicants who have passed in their 10th class examination and completed the ITI course in the relevant Trades and should have Computer Knowledge can apply for this UPPCL Recruitment 2019. Candidates have to pay the Examination Fee through the following mode: “Debit Card, Credit Card, Net Banking”. 1ST April 2019 is the Start Date to Apply. 30th April 2019 is the End Date to Apply. Process for Applying: Concerned applicants may apply online through the UPPCL’s website. The official website through which you can apply for this UPPCL Recruitment is as follow: “http://upenergy.in/uppcl”. The link for applying this UPPCL Recruitment will be active from 01st April 2019 to 30th April 2019. Selection Procedure: Selection of the applicants will be based on Online Objective Test. The Objective test will be conducted by the department.